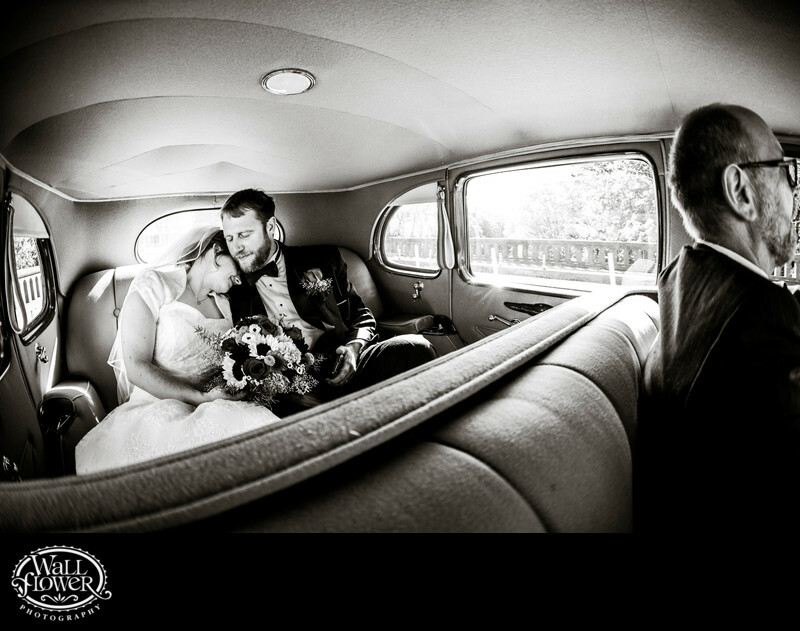 Here's a sweet moment between the newly married bride and groom as they ride in the back of an anitque Packard from the church where their wedding ceremony took place to their wedding reception venue, the Foss Waterway Seaport in Tacoma, Washington. This was their first moment to themselves (more or less) since they tied the knot, and the bride nestled her forehead into the groom's neck as he leaned into her for a quiet, loving embrace. I was riding along in the front seat, from where I took this photo. Antique cars are surprisingly small and crowded inside, and I was using my widest-angle lens, a 15mm fisheye, and twisting my body as far as I could to capture this much of the Packard's ceiling and driver. Without them, and with the bride and groom taking up much more of the frame, the photo would have still been great, but we would have lost much of the unique context of where they were when the moment took place. This wedding was featured in the 2015 issue of South Sound Wedding and Event Magazine.